Stars are the building blocks of the universe. They form in the coldest, densest regions of the most massive objects in galaxies, giant molecular clouds. A simulated dust emission map at 230 GHz from a molecular cloud simulation. Credit: JBCA. These molecular clouds contain up to a million times the mass of a typical star, but during their lifetime only about 2% of this mass will turn in to stars. However, once formed these stars drive the evolution of their galaxy. The formation of stars is a process that has shaped the Universe through cosmic time. Stars created all the elements apart from hydrogen and helium that make up the world we see around us. When massive stars explode the energy and elements they enrich the surrounding gas controls how galaxies evolve. Within galaxies, when individual stars form, planets like our own may also be formed around them. For these reasons, understanding how stars form is an active topic research at the Jodrell Bank Centre for Astrophysics. The evolution of a molecular cloud showing gas collapsing to form a long filament in when stars form (no sound). Molecular clouds are the stellar nurseries where clouds of gas are transformed into clusters of stars by gravity. Currently we are living in a golden age of astronomy, where revolutionary telescopes such as the Atacama Large Millimetre Array (ALMA) in the Atacama desert are able to resolve star formation on size scales as small as our solar system. Such facilities should enable us to study the process of star formation in great detail and work out the key physical processes that make stars. However, there is a major obstacle to this approach. Molecular clouds in space are very much like clouds in the sky, in that they are complex objects with no firm boundaries that are hard to characterise. Surprisingly, it is modern super-computers that may finally allow us to solve this complex problem. Computer programs can be designed to use the equations of gravity and fluid motion to make simulations of molecular clouds. These simulations allow numerical experiments to be performed in order to test how star formation may be influenced by effects such as temperature variations, supersonic turbulence and magnetic fields. A star in the process of formation is surrounded by a disc of dust and gas, which provides the raw material which condenses into planets. We now know of a huge variety of planetary systems in the Galaxy, and planets like 'hot jupiters' probably originated further out than the small, fast orbits where we detect them very close to their stars. Planet formation may originate from compression of the dust and gas by turbulent shocks, and/or self-gravitating clumps; once a protoplanet is well advanced it sweeps out a cleared lane in the orbiting dust and gas. Dust grains emit radiation most strongly at wavelengths up to about 10 times their diameter, so the original, tiny dust grains are seen at sub-millimetre wavelengths, such as by ALMA. Going down to cm wavelengths (such as with the VLA and e-MERLIN) detects pebbles, suggesting that a planet is forming. The Planet Earth Building-Blocks - a Legacy eMERLIN Survey (PEBBLES), led by Jane Greaves (Cardiff) will resolve details almost down to the size of the Earth's orbit (au) in the inner discs around some young stars a few hundred light years away. The central disc, about the size of Saturn's orbit, seen in the e-MERLIN image of DG Tau, suggests that at least 'gravel' is forming; the more extended emission is hot gas in a jet from this very young star. See also: Planet Earth Building-Blocks - a Legacy e-Merlin Survey (PEBBLES) (PDF). 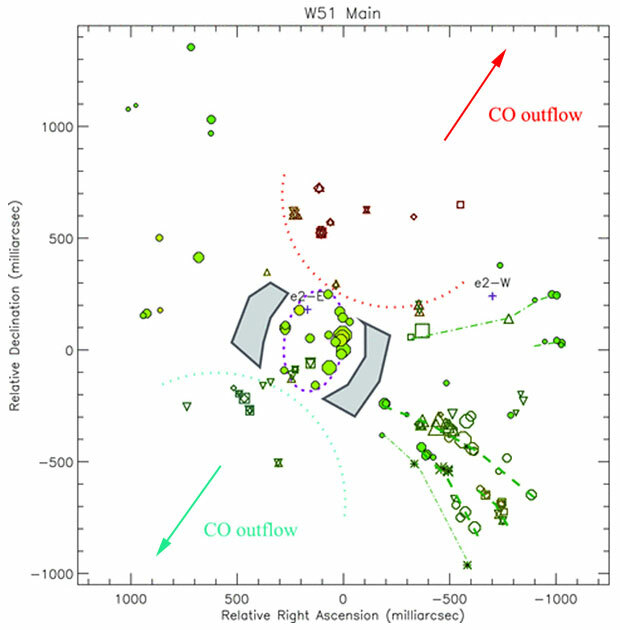 The distribution of masers, detected by MERLIN, superimposed on the axis of a CO outflow in the star-forming region W51 Main. Masers are typically very small objects compared to the sources in which they are embedded. For example, radio interferometers resolve individual maser features at scales of a few milli-arcsecond, compared to protostellar sources of arcsecond size. The phase-referencing technique of radio interferometery allows us to perform very precise astrometry on populations of maser features; if this is done at two or more epochs we can plot proper motions of the masers, and derive statistical information. For example, we can deduce whether the source is in overall expansion or contraction, and whether there is a strongly ordered motion, such as rotation. 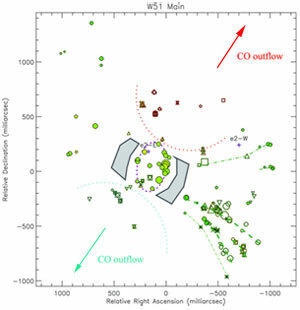 The figure shows the distribution of masers, detected by MERLIN, superimposed on the axis of a CO outflow in the star-forming region W51 Main. Compact continuum sources known as e2-E and e2-W are marked with crosses. The other symbols represent maser features with size proportional to log of the intensity, and colour denoting Doppler velocity from 46.5 km/s (pale green) to 71.5 km/s (dark red). downward (upward) triangles, OH 1665 MHz with lhc (rhc) polarization; squares (diamonds), OH 1667 MHz with lhc (rhc) polarization; open circles, OH 1720 MHz; stars, OH 6035 MHz. A figure showing the filament network we find in one of our simulations (left) and the emission in the 18CO (1-0) line that we predict from this (right). Hubblecast 82: New view of the Pillars of Creation. Credit: NASA, ESA/Hubble.